Starting a VPS for the first time is a big undertaking. In our cPanel tutorial series, we explain how you start using a VPS with cPanel & WHM. The cPanel tutorial series not only includes the hosting of your website and email but also how you can safely set up and update your VPS. General information about cPanel/WHM can be found in our article ‘what is cPanel / WHM’ (or try the cPanel demo). Order a VPS with cPanel here if you do not have one yet. At the time of writing, a cPanel VPS is supplied with cPanel & WHM 68.0.37 combined with CentOS 7. This tutorial also makes use of this. Command line is used in several parts of this article. The commands can be executed via SSH or the VPS console in your control panel. If you do not have any experience using command line, we advise you to first consult our article on command line for general information about command line and the use of SSH. Searching within cPanel You may wonder if you need an X1, 4, 8, or even larger VPS. Which VPS is suitable depends on a number of things, such as the number of websites and email addresses you want to host, the layout of the website(s), the number of visitors, etc. It is therefore very difficult/impossible to say exactly what you need. If in doubt, you can start with a smaller VPS and later upgrade to a larger VPS. It is not possible to downgrade a VPS because of the allocation of disk space on a VPS. When ordering a new VPS with cPanel, a hostname is requested. The syntax we recommend for this is server.yourdomainname.com. Your VPS installs cPanel, WHM and CentOS 7 automatically after ordering. While the installation process is running, you cannot make any changes to your VPS, such as changing the name of your VPS. 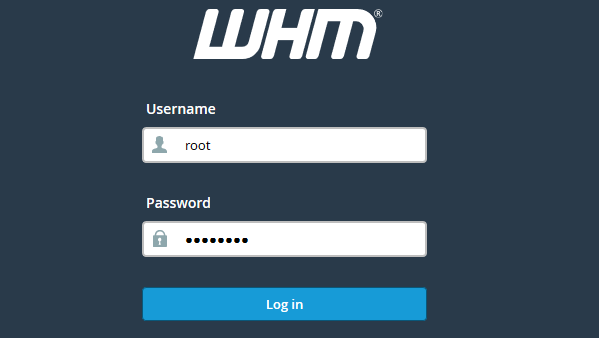 Before you are able to log in to cPanel or connect to SSH, you have to create a user in WHM. This is a security measure from cPanel to keep access to cPanel and WHM separate. You use the password of the root user to log into WHM. After the installation of cPanel, we will automatically send you an email with the password for the root user. Keep the password safe, because passwords are not transparent to us and are not stored. The email that contained the root user's password also contains the web address of cPanel and WHM. This address is the IP of your VPS with the:2083 addition for cPanel and :2087 for WHM, for example, 123.123.123.123:2087. 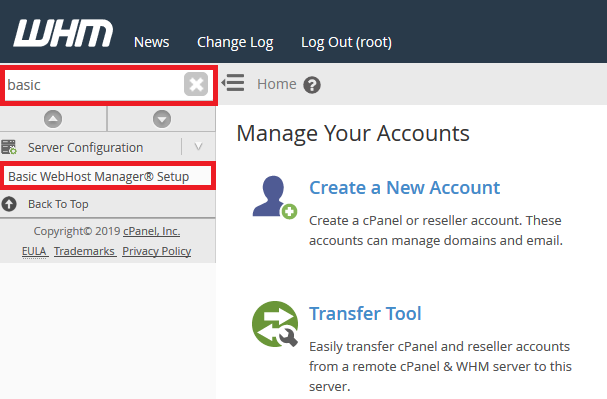 In the steps below, we explain the steps that are involved in logging into WHM for the first time and creating a user for cPanel. 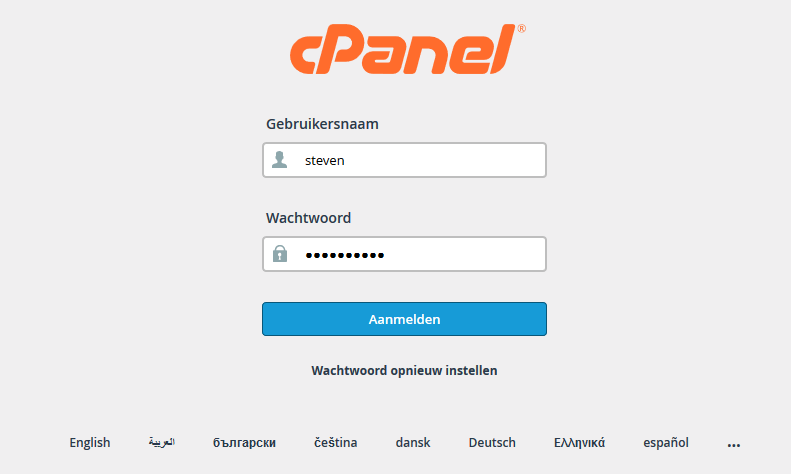 First, go to the cPanel login page (e.g. 123.123.123.123:2087). You will see the following message. Click 'Advanced' and then 'Continue to 123.123.123.123 (unsafe)' to continue. You will then be greeted by the screen shown in the screenshot below. Log into WHM by using your root username and password which were sent by email. 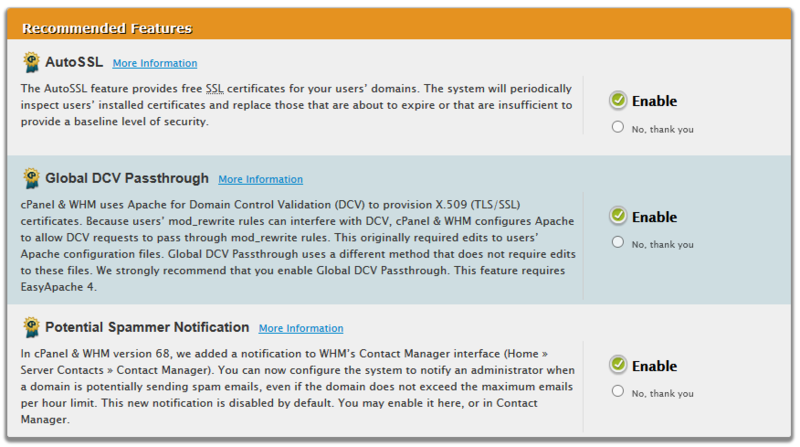 You will see the cPanel & WHM agreement page. Click 'I Agree' after you have read the agreement to continue. The following page shows some recent features that have been added in cPanel & WHM and gives you the option to switch some features on and off. This includes some important options, which we explain in the screenshots below. phpMyAdmin Information Schedule Searches Tweak Setting: This is a new option in 'WHM'> 'Home'> 'Server Configuration'> 'Tweak Settings' and you enable this option if you want to show all MySQL tables in the total disk usage statistics by using MySQL's 'INFORMATION_SCHEMA'. Without this setting, your disk space is calculated based on the filesystem of your VPS, which is less accurate. The Tweak Settings will be explained further in this tutorial series. IMAP Full-Text Search Indexing: Simply said, this option ensures that almost all queries in iMap mailboxes are significantly faster. We therefore recommend leaving this option on 'Enabled'. administrator will be warned by email. Public Contact Information: This is a very important option for resellers. By defining your (company)name and contact page, your customers actually see your data if they want to contact you from their own cPanel account. AutoSSL: Using AutoSSL you automatically link SSL certificates to your domains for free. It is possible to combine this with Let's Encrypt and is explained in more detail in our article ‘installing an SSL certificate in cPanel/WHM '. We recommend using this option unless you use your own certificate. Global DCV Passthrough: For the Domain Controller Validation of the SSL certificates that you create with AutoSSL, cPanel & WHM use Apache. Your own mod_rewrite rules can conflict with this. This risk has been remedied with 'Global DCV Passthrough'. We therefore recommend using this option wholeheartedly. Potential Spammer Notification: This option alerts the administrator of the server if spam is possibly sent from a domain. In our experience, spam from a VPS is rarely caused deliberately but is usually the result of an infected site. We therefore recommend using this option. Clean Cgiemail: We strongly advise against using Cgiemail and/or Cgiecho scripts. The Cgiemail scripts have not been updated by the developer for ten years and cPanel has also disengaged their own support of Cgiemail. This option is best turned to 'Enable'. PHP-FPM Service for cPanel: PHP-FPM is the PHP implementation of FastCGI and offers the fastest performance by far. This option ensures that PHP-FPM is used for all cPanel & WHM PHP applications. We love speed and recommend this option wholeheartedly. Enable SPF and DKIM for all existing domains: This option enables SPF and DKIM support for your domains. This contributes to the security of your email and we definitely recommend it. Existing SPF records are updated within cPanel, but not existing DKIM records Please note that the management of DNS in cPanel falls outside the scope of this tutorial series and will be dealt with in a separate article in the future. For this tutorial series, we assume that you manage the DNS of your domain in your TransIP control panel. We will explain the use of email in part 6 of this tutorial series. Allow hosted address in Contact Information: This option is enabled by default and ensures that people with a cPanel/WHM account on your VPS can use an email address that is hosted on the VPS itself as the contact address. 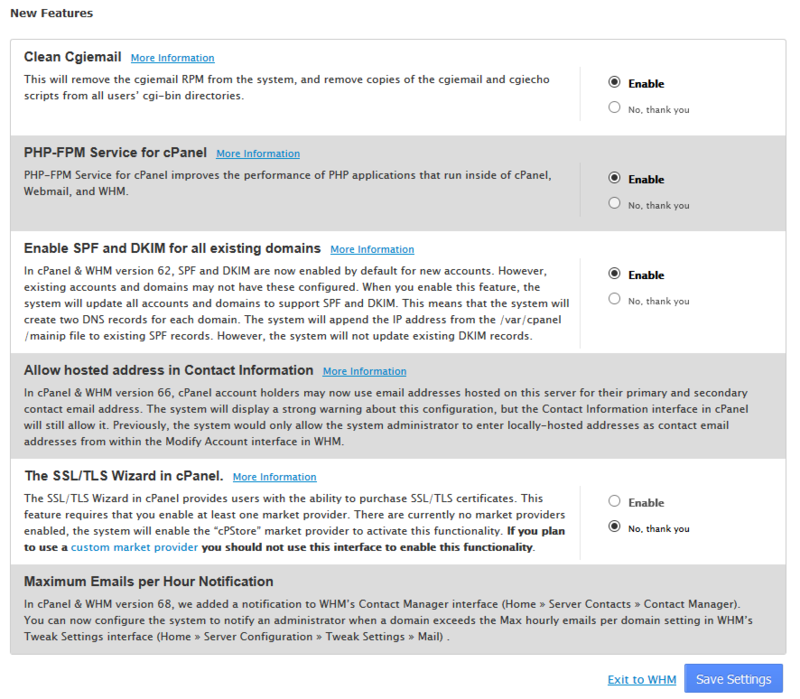 The SSL / TLS Wizard in cPanel: People who have a user account on your VPS can use this option to order SSL certificates. For this tutorial series, we assume that you use a free Let's Encrypt certificate, free AutoSSL certificate (see above), or one of our Sectigo certificates and we set this option to 'Disabled'. Maximum Emails per Hour Notification: We have indicated the daily email limit at the beginning of step 3. In 'WHM'> 'Home'> 'Server Configuration'> 'Tweak Settings'> 'Mail' you also find an option for enabling a notification when a limit per hour is exceeded. Finally, click 'Save Settings' to save the settings. You now enter WHM and receive a warning notification which is the result of no services being connected to your VPS yet. You can immediately close this notification. We then create a new user in WHM (i.e. a new account) who has access to cPanel. To do this, scroll to 'Account Functions' in the left menu and click 'Create a New Account’ or type the word 'Create' at the top left of the search field and click 'Create a New Account' in the search results. You will see the screen below. Fill in the fields as shown in the example below (but using your own data) and click 'Create' below. A short explanation of some of the settings is given under the screenshot. The 'default Package' uses the standard cPanel theme and offers unlimited mail etc. If you would prefer to change this, create a new package by clicking 'Add a Package' in the left menu. Optionally make the new account a reseller under 'Reseller Settings'. The main difference between a reseller and a normal user is that a reseller can also create new users and you can give more rights to resellers, such as the possibility of restarting services on your VPS (we strongly advise against giving that option to someone other than yourself/your VPS administrator). Select the 'Use the nameservers specified at the Domains Registrar' option under 'DNS Settings' to use our nameservers and manage the DNS of the domain in your TransIP control panel. You may leave DKIM and SPF enabled (see Step 4 under 'Enable SPF and DKIM for all existing domains'). Please note: During our installation we received a number of notifications named 'A warning occurred while processing this directive'. The reports were the result of the 'queueprocd' not being started. This is a known problem that has not yet been solved as of cPanel v68.0.23. If you also get this message, remove the newly created account from 'Menu'> 'Account Functions'> 'Terminate Accounts' and restart your VPS from 'Menu'> 'System Reboot'> 'Graceful Server Reboot'. The user you just created does not automatically have the rights to switch to the root user in SSH. You give the new user these rights by adding the user to the Wheel Group Users (we advise you to grant these rights only to yourself and any managers of your VPS, but not to your customers). 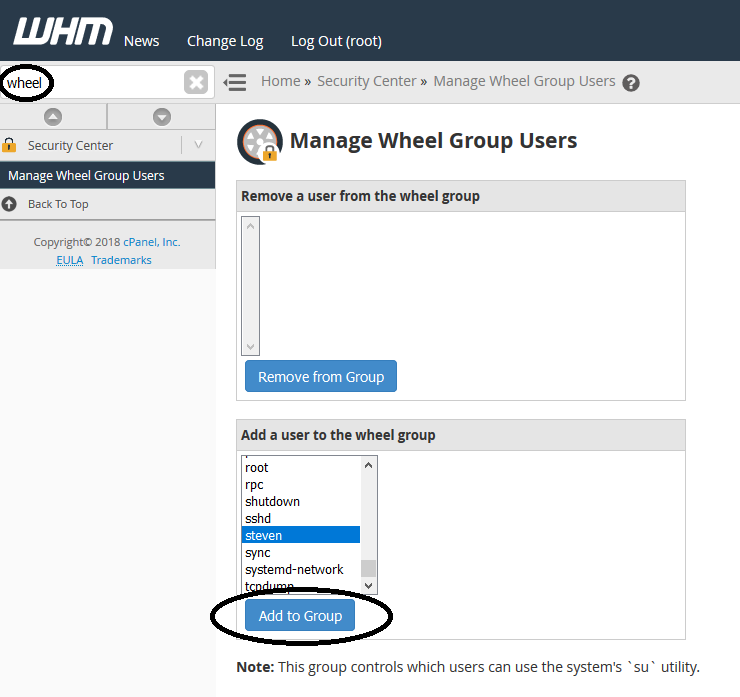 In WHM in the search field at the top left, search for 'Wheel' and click 'Manage Wheel Group Users'. Then select your username in the overview under 'Add a user to the wheel group' and click 'Add to Group'. 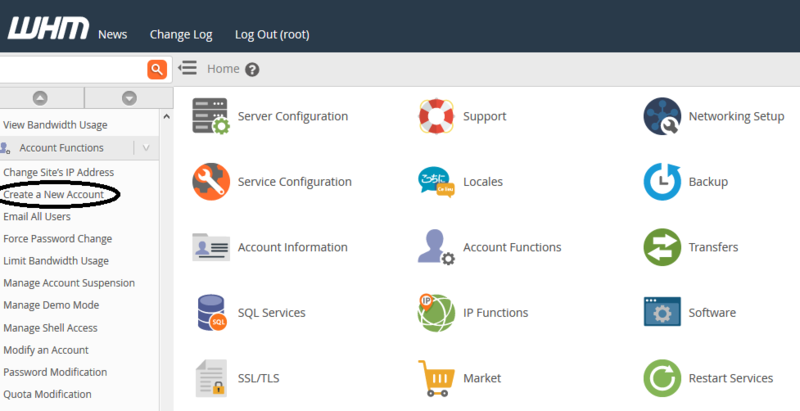 Using the new user, you can now log in to cPanel yourself. Navigate to 123.123.123.123:2083 in your browser (replace 123.123.123.123 by the IP of your VPS) and log in with the user you created in Step 7. After logging in, you get an overview as shown in the screenshot below. 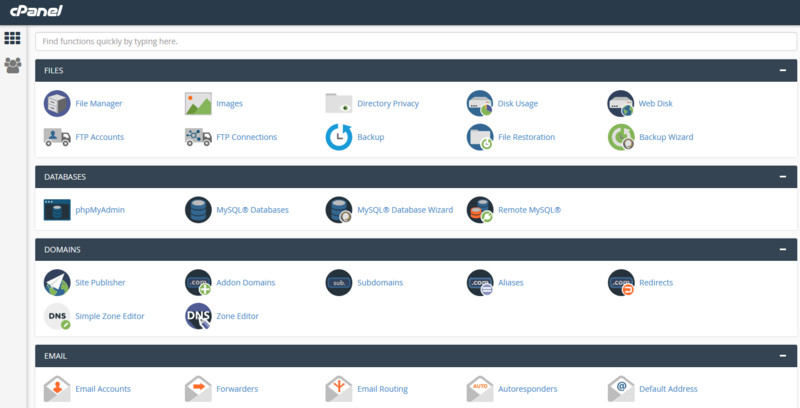 While you are working in cPanel and if you want to return to this overview, click the icon with the nine blocks at the top left. From cPanel you manage all matters related to hosting your domain. In part 5 of this tutorial series ‘Website, Database and SSL' we will work with cPanel ourselves. Please note: When writing this manual, all icons were missing in cPanel. Are they missing on your VPS as well? Then go back to WHM and click the version number of cPanel & WHM at the top right. Then check the option 'Force a re-install even if the system is up to date' and click 'Click to Upgrade'. WHM offers the option to automatically send alerts under pre-specified conditions. The only option that is configured by default is email alerts, but they are sent to nobody@example.com. You change this email address in WHM by following the steps below. Log in to WHM or, if you are already logged in, click the name WHM at the top left and then click 'Server Contacts'. Click 'Edit' next to the address 'nobody@example.com'. Step 4 Edit the email address and click 'Save Changes'. Tip: Want to change which notifications are sent to your email address? Then repeat the above steps but click 'Notifications' in Step 3. A new installation of cPanel/WHM does not come with IPv6 preconfigured. 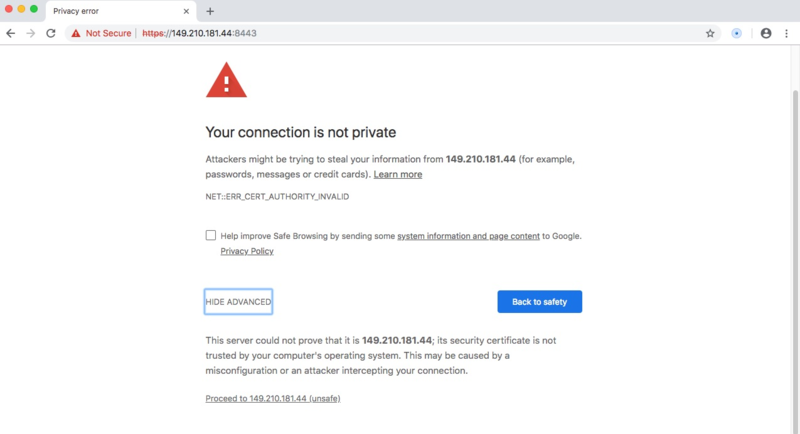 It's important to do configure a shared IPv6 address, because not doing so may lead to problems when using AutoSSL to secure your websites with SSL certificates. Controleer in je TransIP-controlepaneel je IPv6-adres (beheren > netwerkinformatie) en log in op WHM. Zoek op 'basic' en klik op 'Basic WebHost Manager Setup'. Scroll naar onderen naar 'Basic Config' en geef in het veld achter 'The IPv6 address (only one address) to use to set up shared IPv6 virtual hosts.' het IPv6-adres van je VPS op. Scroll naar onderen en klik op 'Save changes'. Het IPv6-adres is niet automatisch beschikbaar voor je cPanel-gebruikers. Zoek bovenaan links in WHM op 'ipv6' en klik op 'Assign IPv6 Address'. Selecteer de gewenste gebruikersnaam, selecteer (de standaard waarde) 'The system's shared IPv6 address' en klik op 'Enable Account'. Wanneer je meer accounts het shared IPv6-adres wil laten gebruiken herhaal je deze stap. Don't forget to add your IPv6 address to your domain(s)'s DNS records. We have arrived at the end of this introductory chapter. Click here to continue to Part 2: Securing your VPS.